Our family of 6 plus a friend enjoyed a restorative week in St. John, made possible in large measure by the wonderful home. The home has upstairs and downstairs living quarters which provided both private space and group space. The house is very well furnished, making cooking in an option. Kids/teens/adults needing to check work email will be glad to know the Wi-Fi is great. Renting snorkeling gear from Crabbys just down the hill for $40/person for a full week, plus the abundance of picture perfect beaches makes for a perfect week. Loved the house and the location. Would stay there again. Great for our family. Spectacular view. Especially appreciated all the details owner provided, maps, coolers, beach chairs, beach towels, beach umbrellas, etc. We love Coral Bay. This house was convenient to the Dolphin market area. Loved Skinny legs and being close to the beaches. Recommended for:Families with Young Children,Sightseeing,Girls Getaway,Adventure Seekers,Age 55+,Romantic Getaway,Families with Teenagers. Beautiful villa, everything you need in a space. We loved the outdoor main bedroom shower with views of the bay. Clean and well stocked. The property manager contacted us via phone twice making sure all was okay. Ceiling fans or breezes flowing always when the decks open. Annie was a trip saver for us, thank you so much, we WILL be back!! On a whim, I rented Coral Bay Outlook for get-away with my two daughters. 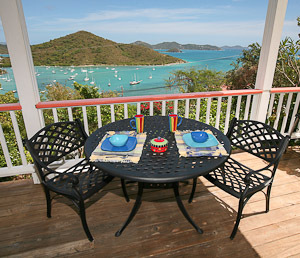 We were thoroughly taken in by the beautiful view from the upper deck overlooking Coral Bay. We loved the outdoor shower and the high ceilings inside. The location was perfect for us. The grocery store and "Crabby's" water sports rental was just down the hill. We could walk to dinner each night. Each morning we packed up the cooler that was provided and set out to explore a different area of the island. We were glad we had rented a Jeep. The steep drive to Coral Bay Outlook and the winding roads of St. John made for a welcome challenge. I hope to rent from Annie again! Recommended for:Girls Getaway,Adventure Seekers,Age 55+,Romantic Getaway,Families with Teenagers. The week was a coming together of three couples - longtime friends who get together far less than we would like. What a great week of sharing stories and exploring the island. St John is fantastic and Coral Bay Outlook was the perfect place for this to happen. Coral Bay Outlook provided all that was advertised and then some. And the views from the porch were fantastic! 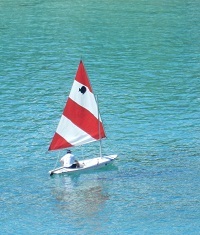 The setting is quiet, relaxing, and the town of Coral Bay was very laid back. The house was well equipped and also offered some nice extras - like numerous guidebooks, information about local services, beach chairs, coolers, etc. Each day we would head off to explore a new beach (or trail) and each night we would share our discoveries over a glass of VI rum. I loved Salt Pond Bay for snorkeling and walking the shore line of nearby Trunk Bay, just because it was so different. Oh, by the way, there is no need to set the alarm to see the fantastic sunrises over the bay - the roosters roaming the village made sure you were awake! I would highly recommend Coral Bay Outlook to anyone wanting to visit and explore St. John. Recommended for: Families with Young Children, Sightseeing, Age 55+,Families with Teenagers. This house was just perfect for our needs. We rented the top and bottom for two families. Annie provided everything we needed for our island vacation and we love eating our meals on the balcony overlooking the bay. The road up is seriously steep, but we got used to it after a day or two! There are grocery stores, restaurants and other amenities nearby and nothing is far away on St. John! Recommended for:Families with Young Children,Girls Getaway,Adventure Seekers,Romantic Getaway,Families with Teenagers. St. John is truly an amazing place. My extended family (seven in all) spent a lovely week at the Coral Bay outlook. The house is exactly as described, and there were many extra touches that just made it so perfectly handy (coolers and chairs for the beach, a line on the deck to dry towels, information and maps about St. JohnÉ) It was a pleasure working with the owner, and I would wholeheartedly recommend Coral Bay outlook if you are looking for a magical place away from the hustle and bustle of your life! Recommended for:Families with Young Children,Sightseeing,Girls Getaway,Age 55+,Romantic Getaway,Families with Teenagers. My wife and I greatly enjoyed our 10 day stay at Coral Bay Outlook. We stayed in the upstairs unit where the 180 degree views of Coral Bay and beyond were excellent. We enjoyed the outdoor showers, the night sound of the tree frogs, the wild goats and donkeys, the snorkeling, the hiking, feeding the bananaquit honeycreepers, and eating dinner at AquaBistro. The beach chairs were a big bonus. It's difficult to identify a favorite beach since there are so many, and they each have their own attributes. We monitored the winds and currents on the weather channel to determine which area to go for snorkeling each day. Recommended for:Sightseeing,Adventure Seekers,Age 55+,Romantic Getaway. My family had a great stay at Coral Bay Outlook. We rented the entire house and my mom enjoyed her own space in the downstairs unit. Coming from a very flat, close to sea level area, the hills were intimidating. But worth it for the views, the breeze and being able to sleep comfortably with the windows open. I loved the outside shower! We walked to AquaBistro for dinner twice. The cooler and chairs were a big bonus! We went to a different beach every day and packed lunches and drinks. I rent often from VRBO. Annie was the most helpful and informative person I have ever rented from! As this was our first time in St. John, I received great information on what to expect and how to get to the Coral Bay from the airport. Recommended for:Sightseeing,Adventure Seekers,Romantic Getaway,Families with Teenagers. Comfortable, convenient and what a view! Our family of four came here to escape the relentless Boston snow, and we were in heaven with perfect 85-87 degree temperatures and bay breezes. The home is exactly as pictured. The owner Annie was prompt and pleasant to work with and provided excellent tips and directions. The property manager Kaaren was on top of things and cautioned us that the open air bar might be noisy on one of our nights, but that didn't bother us as the music was fine. Each morning began with sunrises and birdsong. The location is ideal for exploring the entire island from Cruz Bay to the northern beaches to the East End; simply pack your jeep with the coolers and beach chairs provided for your use. You can walk down the hill for groceries, mail/print services and restaurants, then back up to peace, privacy and that amazing view. Recommended for:Families with Young Children,Adventure Seekers,Families with Teenagers. My family of four which included a 2 year old grandson enjoyed our stay at Coral Bay Outlook, the views were the best ever as in was our 15 th trip back to St.John! Did not know there was an additional cottage behind us so parking was a bit tight and one shower had extremely slippery floor! On island manager was receptive to issues we had but overall very simple furnishings and comfortable. Recommended for:Families with Young Children. My husband and I stayed in the Coral Bay Outlook garden level suite for five days in March and loved it. It was perfect-- comfortable, clean, convenient to everything, wonderful views, great restaurants and heavenly beaches right nearby. The property had everything we needed, and dealing with The owner and with the property manager on site was great. The communication in advance was thorough and so helpful. All good! What a great find! Our group of 7 had a great week-long stay at Coral Bay Outlook. We found the house to be clean and comfortable with all the necessary amenities. The location was spectacular (though as other reviewer commented the driveway was very steep and 4WD seems like a must) and we really appreciated watching the sunrise from the balcony each morning. The outdoor showers were wonderful, and the full kitchen/gas grill made staying in and cooking dinner very easy. We would recommend Coral Bay Outlook! Recommended for:Families with Young Children,Families with Teenagers. My wife and I stayed at Coral Bay Outlook for a week in Jan 2015. We rented the second floor and we loved it! The best feature has to be the location, which is far enough from the shore to minimize noise but still close enough to be convenient. The road to the house is challenging but easy after the first drive up. The house has plenty of amenities, and we really appreciated the full kitchen and gas grill. We only slept in the king bed upstairs, but I'm sure the others were just as comfortable as the king. The outdoor shower was a nice touch and enjoyable after a day of snorkeling. There was also a wealth of information provided by Annie and Andy and previous guests about what to do and where to eat. We'll definitely stay here again! We Love The Coral Bay Outlook! My Sister, a group of friends and I were looking for a place to rent to visit our Mother this January. We have rented many homes on the island in the past and the Coral Bay Outlook has been one of our favorites! We rented the entire home for our group, both the top and bottom level. Not only was the place so clean it also had everything we needed for our stay. Everything from coffee pot to clothes pins for us to hang our wet towels out to dry! We enjoyed the friendly notes, wifi, games, books and other island information the home had to offer. The home also has a TV but we didn't even turn it on once! The home was specious for our group and our Mother is a resident of St. John and she even stayed a couple of nights too to "get away." We spent every morning/evening sitting on the verandas and enjoyed the peace and quiet of the area. Another great perk is the home is very close to other restaurants and close to a grocery store for those that are interested in dining out and in while on vacation. Make sure you rent a jeep when staying at the Coral Bay Outlook. It is true- many of the hills on the way up to the home can be very intimidating but by day two you feel like a pro! The owner Annie was a pleasure to work and provided us with all the information we needed for the rental. The with the same with the onsite manager Kaaren. I'd highly recommend renting the Coral Bay Outlook! I know we will be back! Recommended for:Sightseeing,Girls Getaway,Adventure Seekers,Age 55+,Romantic Getaway,Families with Teenagers. Coral Bay is The Place to Be! We really enjoyed our stay here! We started in St. Thomas for a wedding and had a few days in St. John, but I wish we had more. Annie was one of the few kind enough to rent for a shorter stay, which we greatly appreciated as we really want to be on the Coral Bay side of the island. Annie was also very helpful in preparation for our trip. Then, once we arrived, we loved the place! Yes, the first drive up the hill is intimidating, but what isn't on that island? But once you are up there, it is totally worth it! The place was very clean, comfortable, and had everything we needed. Most importantly, it had everything you might want for the beach which is about all we did during our stay. We cooked in a lot and the kitchen worked well for us. We brought most of our food from St. Thomas, but there were markets close by to get anything else you needed. St. John is a pretty magical place, and Coral Bay Outlook is a great option as a place to hang out, eat, drink and sleep! P.S. Bring lots bug spray as there were a ton of bugs all over the island! Recommended for:Sightseeing,Girls Getaway,Adventure Seekers,Romantic Getaway. Thanks so much for your great review. I'm only sorry that the bugs were plentiful, but it has been unusually wet this June. Bugs are seldom a problem, and we have mosquito nets for all the beds just in case. Coral Bay is the place to stay on St. John! VRBO.com has been a reliable source of vacation home rentals for us over the years. Coral Bay Outlook was no exception! 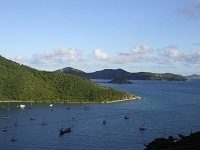 Advertising (pictures, descriptions, location) accurately depicted the home and the Coral Bay area of St. John in general. Coral Bay Outlook is a property featuring a 2-level villa (each of which can be rented separately) and an additional, smaller detached rental unit. While we were there (March 9-16), all three units were rented separately and posed no inconvenience. We rented the upstairs level of the Main Villa. It features a vaulted and open floor plan including a kitchen, dining and living room. There are 2 large bedrooms, each with a complete bathroom and shower (outdoors--which was fun). 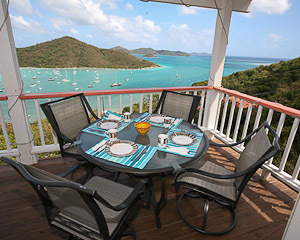 The deck offered fantastic views of Coral BayÉthis was our favorite part about the villa! Oh, and being a family of 5 (children ages 8, 13 & 16), we really appreciated the on-site laundry! Although this has been mentioned in other reviews, it's worth repeating: Staying in Coral Bay, much less Coral Bay Outlook, requires a 4WD vehicle. This is good thing! Our vacation to St. John was a long awaited one and it definitely did not disappoint! Having visited every corner of the island, we are very pleased that we stayed in the Coral Bay area. When we return--and we will return--Coral Bay will be our destination! Cruz Bay was very nice, just more hustle & bustle than we were seeking. Instead, we spent our week at the north end beaches (Cinnamon Bay, Hawksnest Bay, Maho Bay, Trunk Bay) as well as some nice snorkeling spots. We found some great little restaurants in the Coral Bay area and toward great Salt Pond Bay. And finally, I need to mention Annie (homeowner). She was a pleasure to work with. She offered the right mix of advice, knowing people come to St. John to find their own way! We personally enjoyed Coral Bay Outlook and would't hesitate to refer our friends to Annie! Recommended for:Families with Young Children,Adventure Seekers,Age 55+,Romantic Getaway,Families with Teenagers. Coral Bay Outlook is a great vacation home. The owners were easy to communicate with. The house is easy to find and central to everything we wanted. Looking forward to another stay in the future. Coral Bay Outlook was a great place to call home while we were on St. John. The villa was immaculately clean upon our arrival. The manager called the first day to make sure everything was OK. She was very helpful. View from the deck was fabulous. Kitchen appliances worked well; dishes and utensils were adequate but a few more salad/cereal bowls would be good. The location is good for getting to all our favorite spots on the island. However, a few nights we had to use earplugs to get to sleep because there was loud music from the restaurant at the bottom of the hill. Voices from nearby houses might also bother light sleepers. But overall, it is a great villa that I would rent again. Recommended for:Adventure Seekers,Age 55+,Families with Teenagers. We are very pleased that our guests find our house immaculately clean, our view fabulous and our location extremely convenient. Our location near the village of Coral Bay has many advantages including walking distance to several excellent restaurants with open air bars (you can have all the rum punches you want and donÕt have to use a car to get home). When there is live music at one of these dining establishments, it sometimes reflects off the water and usually provides pleasant ambient sound until 10PM when the music is required to cease. Occasionally musicians and restaurateurs get carried away. In the case mentioned in this review, the owner of the restaurant was arrested for violating the noise ordinance. This is regrettable, and it is the first time in the 9 years we have owned the property that one of our guests has had a problem. Coral Bay Outlook was better than the pictures. The home was clean, well stocked with maps, towels, things to do, beach stuff, dishes, etc. It was a home away from home. Upon arriving we received a call from Kaaren the property caretaker welcoming us and asking if we needed anything. There were enough dishes and utensils to prepare just about any meal. Coral Bay is the best side of the island as it is closer to most of the beaches. The owner communicated right away and her directions were perfect. The view is excellent especially the sunrise. The driveway is an initial challenge and easily navigated. A truly special property! The views and comfort of the accomodations were excellent. If you plan to be active in your stay, this central location is perfect! Miss Lucy's for Sunday brunch was fantastic and get there early. We liked being able to access most of the beaches, which are great for swimming and snorkeling. Overall the home made for a wonderful week in St. John's. The owners couldn't have been nicer and were so easy to deal with. We would certainly stay here again. Recommended for:Families with Young Children,Sightseeing,Adventure Seekers,Age 55+,Romantic Getaway,Families with Teenagers. We chose Coral Bay on St John for proximity to water activities, hiking, and beaches and were not disappointed. 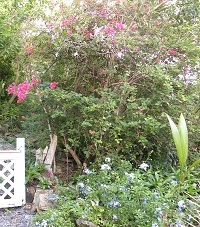 The owner was helpful and on-island manager available and helpful as needed. The home is roomy, clean, serene, and well equipped. We chose to "eat-in" most of the time (bring as many grocery items from St Thomas as feasible) and had everything we needed in roomy kitchen to cook and pack lunches for daily adventures. (Good advice to rent car in St Thomas, load up, and ferry over to St John.) Great out door activities on St John and we enjoyed a different location each day. We had some evening rain and wind but had movies and couches for relaxing but mostly enjoyed the deck and views. "Night life" closes up around 9pm at the local restaurants but we had plenty to do - daily weather was great! Four wheel drive is for real - drive carefully and enjoy every corner of St John! A great week at Coral Bay Outlook! Our family of five had a wonderful week at this rental property! Great communication from the owners prior to booking and wonderful maps and suggestions at the villa were very helpful for our stay. The villa was very clean and nicely decorated. The view from the balcony was fabulous. It was a great home base for our family. We hit different beaches each day and had a fabulous time. Coral Bay was a nice central location for our adventures! Coral Bay is definitely the best side of island to stay in. It is quieter and easy access to great beaches and some nice dining. The owners were quick from the start to contact you and give you everything you needed to know. The drive up the hill does at first take your breath away but you get used to it and it is paved. It is worth it when you arrive "home" as the view is amazing. The sunrise over the bay and surrounding islands in the morning is the best and with a cup of coffee...a real vacation. The place itself is very comfortable with loads of information on the island. We truly enjoyed our time there and definitely would recommend it to you if considering it. 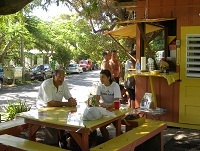 Miss Lucy's is one of our favorite for food...the breakfast on Sunday is sooo good and the bushwacker drink is a must. Best to go right at 9am or more after 12pm because of the popularity. Beautiful island and so worth going to see. Recommended for:Families with Young Children,Sightseeing,Girls Getaway,Tourists without a Car,Adventure Seekers,Age 55+,Romantic Getaway,Families with Teenagers. A truly magical property! The views and comfort of the accomodations were excellent. The owners and property manager were more than helpful in making our stay the best vacation we have ever had. If you plan to be active in your stay, this central location is perfect! Recommended for:Families with Young Children,Sightseeing,Adventure Seekers,Romantic Getaway,Families with Teenagers. 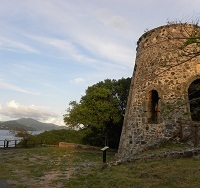 We love St. John--have visited many times. Coral Bay is our favorite part of the island for its quiet, charming beauty. This year we were joined by our daughter's family of 4. Coral Bay Outlook was perfect for our two families--room to enjoy it together and also for privacy. Everything was very clean and attractive. It had everything we needed for a week in paradise. We loved the views from the decks and the nearness to stores and restaurants in Coral Bay. Thanks for sharing your home. We stayed at the Coral Bay Outlook from March 31-April 7, 2012. 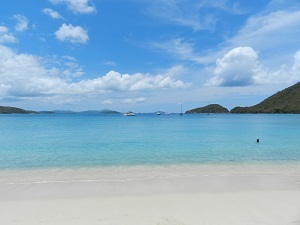 It was our first trip to St.John and we thoroughly enjoyed it. We rented the entire villa with my husband and I and our 2 sons (ages 17 &20) staying upstairs and my 83 year old father hanging out downstairs. The photos and listing are extremely accurate representation of this villa and the views actually exceed the descriptions. We loved Coral Bay - as it is laid back and very accessible to both the North and South Shore Beaches and snorkeling sites. Both villas were sparkling clean, well stocked and thoughtfully provisioned with ample beach supplies such as chairs, umbrellas, towels and coolers. Booking was a breeze and the owners are quite friendly and helpful. I really recommend paying attention to their suggested weekly itinerary as their recommendations are really good. Like many before us, we loved sitting on the deck in the morning, watching boats, stars and the sky. We also enjoyed listening the music waft up from the bars below as it added to the vacation atmosphere. I highly recommend this property and expect that wee will return! Wonderful spot for a relaxing vacation with great amenities and spectacular views. we stayed 5 nights in March 2012 and were very impressed by the accommodations. Clean, well appointed and great location made this rental a vacation high spot. We cooked in and went to a lot of local restaurants and bars. If you are feeling energetic you can leave the car at home and walk down to the bars - the walk up is steep but not too far. Would highly recommend. We spent a beautiful week staying in the garden unit of this home. The home has everything you need for a relaxing week on St. John -- comfortable accommodations, access to beach chairs and a cooler, spectacular views and easy access to other amenities. We especially enjoyed all of the guide books and suggestions found in the home; it really helped to guide our trip. You can't go wrong with the Coral Bay Outlook! Best house my friends and I have rented! It is perfectly located above Coral Bay, close enough to walk to the restaurants, yet far enough so that the music is not too loud. It has a fabulous view, very well appointed, has everything you would need for the house and the beach! The road up is certainly a challenge as is the parking, but you get used to it--4WD a necessity! I definitely would rent this lovely home again! This is a lovely house with a spectacular view of Coral Bay. Convienently located and very comfortable. All you need for a great get-a-way. Already Trying to Figure Out How Soon We Can Go Back! My husband, three children and I spent a week at Coral Bay Outlook. The villa was charming, with everything we could have possibly needed. Very, very clean and well kept. Amazingly gorgeous views from the deck. The owner was very communicative from the time we inquired to the week before our trip. When we arrived, the property manager was on-site and gave us lots of local information and was happy to help with whatever else we may have needed. Highly recommended and would definitely stay there again!!! Four of us (2 couples) spent a week in March at Coral Bay Outlook in the upstairs 2-bedroom unit. Great location for access to snorkeling, hiking, kayaking if you rent a car or jeep. 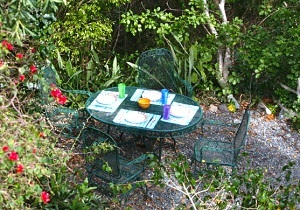 The house is nicely furnished; the kitchen well-equipped with extras such as local guidebooks and beach chairs. The owners were very friendly and helpful. We recommend this place and would definitely stay here again. We are a family of 4, spent a week in February on the upper level and enjoyed our vacation a lot. The house offers everything you need plus great views. The island is great - wonderful beaches, great snorkeling. A Fine Week in Coral Bay Outlook! We stayed in the Garden Level, which was just right for two. Everything we needed was there. We enjoyed being so close to town, including the great views right down into Coral Bay harbor, and enjoyable musical sounds from the near-by (but not too near-by!) restaurants. The listing describes the property very well. We snorkled every day, including a delightful day on the "Long Distance" 40-foot sailboat courtesy of Rick and Robin. Annie was very helpful in arranging our rental. A 4 wheel drive jeep is helpful. Good to heed Annie's advice to arrive in daylight if this is your first visit to Coral Bay Outlook; the switchbacks leading to the house are a little challenging after dark if this is your first time. We hope to return another year. We had a wonderful stay at Outlook. This house has a fantastic view of Coral Bay and easy access to the restaurants in Coral Bay. Cool breezes from the sea can't be beat at this elevation. Plus its close proximity to the North Shore beaches is good too. The kitchen is well stocked, plenty of towels, beach chairs and a cooler too! We loved the outdoor shower overlooking the harbor. We recommend this villa to friends and family. Thanks Andy and Annie for opening up your house to us again. :) We will return for sure! We were 7 and rented the whole house for 10 days, the upper for kids (5) and the lower for us. Great! The house is exactly as posted. Nice to travel light having there beach towels, chairs, umbrellas, cooler and even noodles. Would definitely rent it again and would strongly recommend Coral Bay vs Cruz Bay. Coral Bay is perfect, quite and near north and south beaches, restaurantes, supermarket, etc. We ate at "home" every night and found everything we needed. The owner was very helpful and answered our needs more than promptly. Even though we stayed in July-Aug, the house was cool. Well another great week at the house, it was our third visit to Coral Bay Overlook. This time we took my parents for their 40th wedding anniversary! We booked the whole house and had my parents stay with the three kids, their grandkids, upstairs. This allowed for mom and dad to sit at night on the deck below and relax. As usual the house was clean and well maintained. If you have never been to St. John and you need an affordable place to stay with your family this is the place, trust me! We have been going to the Island for many years and now we don't even bother looking anywhere else to stay. Coral Bay Overlook has what the typical family needs for a great vacation. My recent stay in the Coral Bay house was just as expected. The location is perfect for exploring the beaches on St. John, and the market at the bottom of the hill and nearby restaurants were very convenient. The house is spacious, and the deck is a lovely place to have breakfast or cocktails and watch the birds. The outdoor shower provides an opportunity for lizard watching. I would recommend the house to anyone who would like a vacation in a quiet spot, away from the hustle and bustle of Cruz Bay. Have Your Breath Taken Away @ Coral Bay Outlook!!! My husband and I often reminisce of our stay at the ~Coral Bay Outlook~. This is where we really feel in love with St. John. It was our second time visiting the island, and I would say that if you really want to enjoy the island's natural beauty, Coral Bay is the place to stay! Every morning we woke up to the peaceful sounds of nature, had breakfast on the veranda as we soaked in the magnificent views of Coral Bay, and joined by the island birds. The house has the island feel, it's very comfortable, spacious, and clean. Annie makes sure you have everything you need to make your stay a pleasant one. It's perfectly situated, market and shops right at the bottom of the hill, near many great restaurants, gorgeous beaches, awesome hikes. 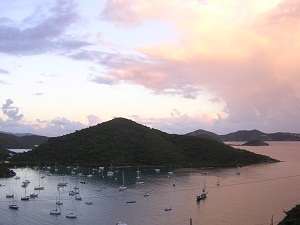 If you want to really experience St. John's in all its beauty, The Coral Bay Outlook is the ideal place to stay. We stayed on the lower level at Coral Bay Outlook and found the views to be amazing. We loved eating on the deck gazing at all the boats! Had everything we needed to enjoy 5 wonderful days on St. John. This was our 3rd time to St. John but our first in Coral Bay. We will definitley come back to Coral Bay Outlook. Such a great location to get to all the amazing beaches. What a breeze also!! The house was exactly as described and would highly recommend. Best Snorkeling:Salt Pond Bay, Waterlemon Cay, Rocks between Solomon and Honeymoon Beach. Best Eats:Colombo Smoothies, The Tourist Trap, Skinny Legs, Island Blues and Donkey Diner for breakfast. This property is gorgeously located and has everything you need for a wonderful vacation. Listing is totally accurate, owner and caretaker incredibly helpful, house is lovely!! (Upstairs is a lighter, more open place) We enjoyed beaching (all the beach equipment you could ask for is at the house), hiking, a daytrip on the catamaran "Calypso" including snorkeling and an afternoon on Jost Van Dyck (BVI), lots of great restaurants (Island Blue, Skinny Legs in Coral Bay, Woody's and Margarita Phil's in Cruz Bay) grilling out on our own deck (gas grills on covered decks on both levels). Indoor/outdoor shower is wonderful as long as the weather is good. There is even a nice selection of DVDs and vacation books in case you want to kick back and do that some days. When they recommend a 4-wheel drive vehicle they mean it though--even getting up the hill to the house is steep! Parking anywhere on the island is getting to be an issue--be prepared. We would definitely return or send friends there. Great place--wish we could have stayed longer. Our stay at Coral Bay Outlook was fabulously tropical and convenient. By the end of our stay, the house felt like a home. 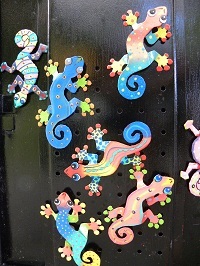 Everything is tastefully decorated in island style. The kitchen is well equipped and designed for multiple users. The house really has an open feel to it that is hard to perceive by looking at the pictures. My favorite feature of the house is the marvelous indoor/outdoor shower. You enter the large terracotta- tiled shower from the inside, but once in the shower, you have an open rooftop and magnificent view of the harbor. We lived on the deck with its fantastic view of Coral Harbor. I think my husband could have sat there all day watching the boat arrivals and departures. 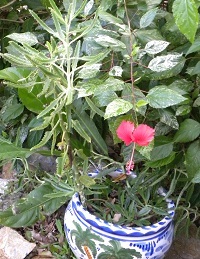 Although our visit was in July, we had great tropical breezes our entire stay. The house is convenient to markets, Lily’s Market and Love City; restaurants, Island Blues (our fav), and Miss Lucy’s (don’t miss the brunch), snorkeling gear rental at Crabby Shack’s, deli food and sandwiches at Big Belly Deli, and of course the beaches, both North and South. The house had chairs, coolers, and beach towels for beach use. The outside of the house was well landscaped with a “patio” area with table, chairs, and a bench. 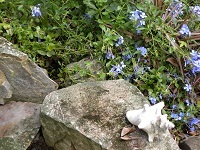 I really loved the coral and shells built into the outdoor steps and wall. All six of us were very comfortable in the house, with two of us bunking downstairs in the garden villa, and the other four of us upstairs. Both up and down stairs have decks and great views. You just won’t get the same laid back island feel in Cruz Bay—Coral Bay Outlook is the place to stay. Annie was a great owner to work with in all aspects of the trip. She was a great help in making the booking and payment of the house relatively painless and gave us some great ideas for places to visit! The house was exactly as we imagined, clean, spacious, and well equipped. The upper level deck was great at night, as you could hear the local bands playing at the bars below, and the moonlight reflecting off the water was awe inspiring. The neighbors were very helpful when asked but basically went about their daily chores with a friendly “hello”. The house was only several minutes from Coral Bay making it easy to run out and get supplies as needed, depending on where you stay on St. John this is not always the case. Overall Coral Bay Outlook was a nice affordable house which became our base for a wonderful vacation. Coral Bay Outlook Has It All! We had the pleasure of staying at Coral Bay Outlook in July 2009 and it was amazing! The house couldn't have been more perfect. It was clean, attractively decorated, well-stocked and beautiful. We enjoyed the constant breeze throughout the house, the stunning view from the front porch and the convenience of the location. The house was privately situated, yet allowed for easy access to local restaurants (several with live music), shopping and beaches. It was a great relaxing week and we plan to be back soon! Great House. Super clean and accessable to several resturants, groceries, and 20 minutes from Cruz Bay. Great breeze on the deck and views are wonderful. 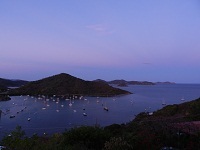 Sunrise across Coral Bay and night view of bay are beautiful. Close to all the snorkling and bays. Would stay again. Stayed in the upstairs with two bedrooms which had plenty of room and could cook in or go to near by resturants. Drinks on the deck in the afternoon with the view and breeze were super. 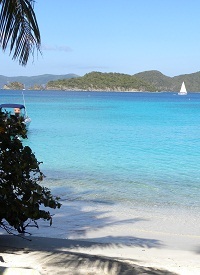 Makes St John the perfect place for a family vacation! St John is a special island.